Santa Brought Us A Dual Colour 3D Printer – Make It! Create It! Learn It! A great news for the Make It! valuable customers: We have a new printer in our creation lab; An Ultimaker 3 Extended, one of the best desktop versions in the market. Ultimaker has been a recommended 3D printer among pros and in the latest Make: Magazine (Dec. 2017/January 2018) issue, Ultimaker 3 was ranked number 4 (based on the Machine Rating) in the “Ultimate Guide To Desktop Fabrication”. The printer is famous for its accuracy and clean printing. This version also can print in dual colours so we are working on adding this service to our regular 3D printing service in the Make It! Another great opportunity with this printer is it works with PVA filament too. 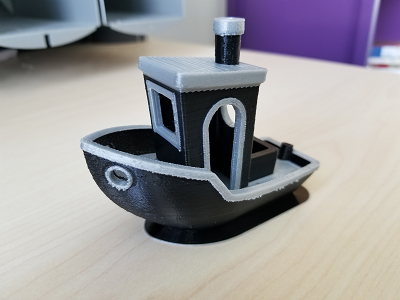 PVA is a dissolvable plastic in water so you can use it as Support and then clean the print job in the water to get rid of support without any marks on the main job. We hope to add this material to our printing service too. We haven’t named it yet. Probably you want to help us to pick the name. Please email me your suggestions and if it’s chosen, get a free print job with this printer as a reward! To see the full specifications, please go here.